Sure and begorrah, it’s not St. Patrick’s Day until tomorrow, but it is Friday night, and our lucky leprechaun Kasey felt like getting into the Irish spirit a little bit early. Happy St. Patrick’s Day to all, and may the road rise to meet you tomorrow! It’s St. Patrick’s Day, and in downtown Columbus there is a parade today. Virtually every American city has one, and many cities — Savannah, Pittsburgh, Chicago, New York — lay claim to having the biggest, beeriest, blowout celebration next to Boston. But what about St. Patrick’s Day in Ireland? It just so happens that Kish and her sister, the Long Beach Recent Retiree, are there on the Emerald Isle as we speak, kicking out the jams with the residents of Galway and celebrating the saint who drove the snakes from Ireland — or whatever he’s supposed to have done. 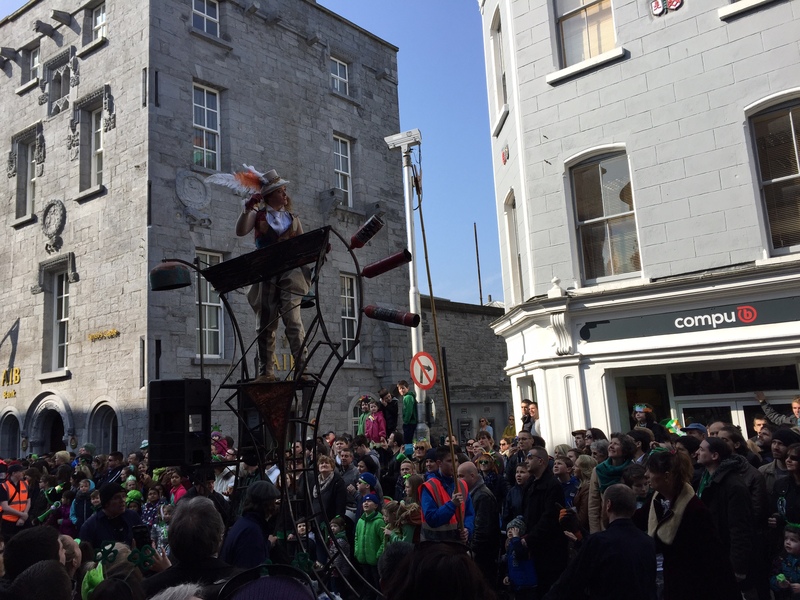 The photo above is of the Galway parade, and the gray building in the background is the Lynch Castle (now the branch of a bank) which dates from the 1600s. 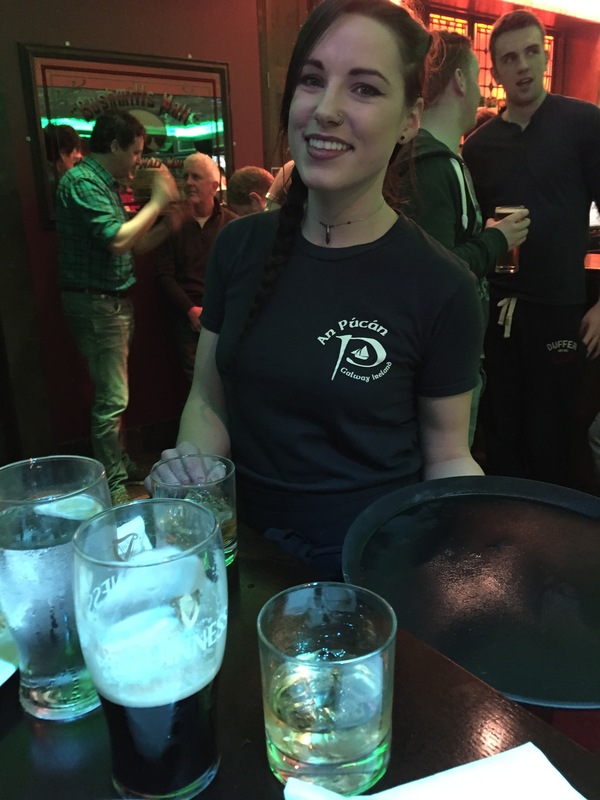 The bar scene below is from one of the many pubs that the sisters have decided to visit — purely to get a clinical sense of what an Irish St. Patrick’s Day celebration is like. Pay no attention to those empty glasses of Guinness and apparent tumblers of whiskey! Happy St. Patrick’s Day to all of our friends who are Irish and Irish wannabes. Although we have a touch of Irish ancestry on my Mom’s side of the family, I’m not a green beer drinker or a huge celebrant of the holiday. 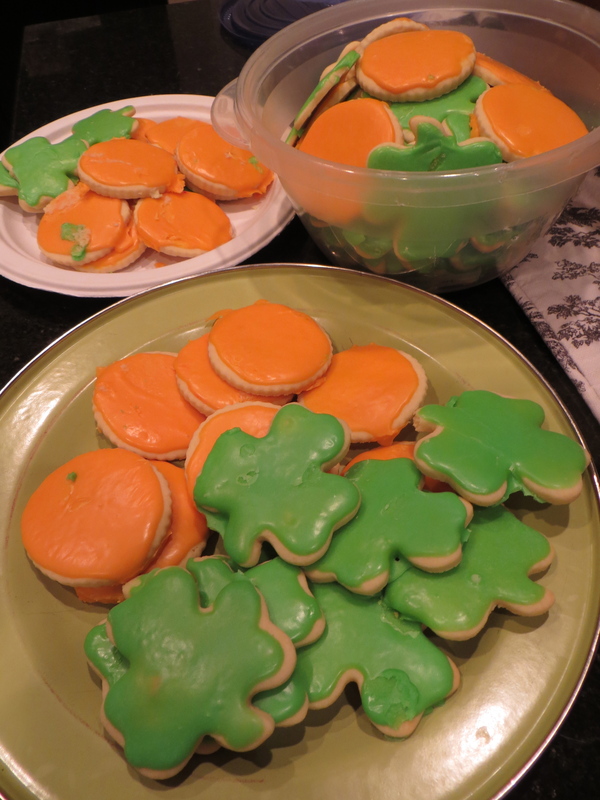 I decided to mark the occasion, instead, with some cookies shaped like shamrocks and the gold coins found in the leprechauns pot of gold that I’ll be delivering to Mom today. Although there is some Irish ancestry in our convoluted family tree, I don’t pay much attention to St. Patrick’s Day one way or the other. This year, though, I’m glad to see March 17 pass by, because I hope to never again see the frightening McDonald’s shamrock shake commercial. Many TV ads suggest deep back stories, but nothing as troubling as that reflected in this 30-second depiction of a profoundly dysfunctional marriage. The husband would do well to turn and sprint out of the house, drive away at breakneck speed, and change his identity, before his deeply disturbed and terrifying mint-loving wife decides it’s time to take even more severe steps to keep his behavior in line. Run, buddy! Run away as fast as you can, before it’s too late! Could this commercial actually be successful in enticing the average person to try the shamrock shake that evidently has moved the wife to the brink of axe-murderer craziness? Last night the Windward Passage offered a lean corned beef and cabbage entree in celebration of St Patrick’s Day, however corned beef is not considered an Irish national dish and stems from early Irish American culture. In Ireland their closest traditional dish is bacon and cabbage, but when Irish immigrants moved to this country in the eighteenth century they substituted corned beef considered a luxury item in their home country because of it’s lower price compared to bacon. If you want to try Windward’s corned beef and cabbage it’s our Wednesday lunch special every week. As far as the picture goes, the group above was one of the last to leave the restaurant and I guess it shows if you love the Windward customers they love you back !